This Memorial day, Albuquerque hosted 29 balloons in their annual Rio Grande Balloon Classic. The event was a sanctioned event with the HACD that also included the New Mexico State Championship which featured 18 of the 29 pilots. In addition, this year’s event hosted the Southwest Regional Championship with 22 pilots out of the field competing for that title. 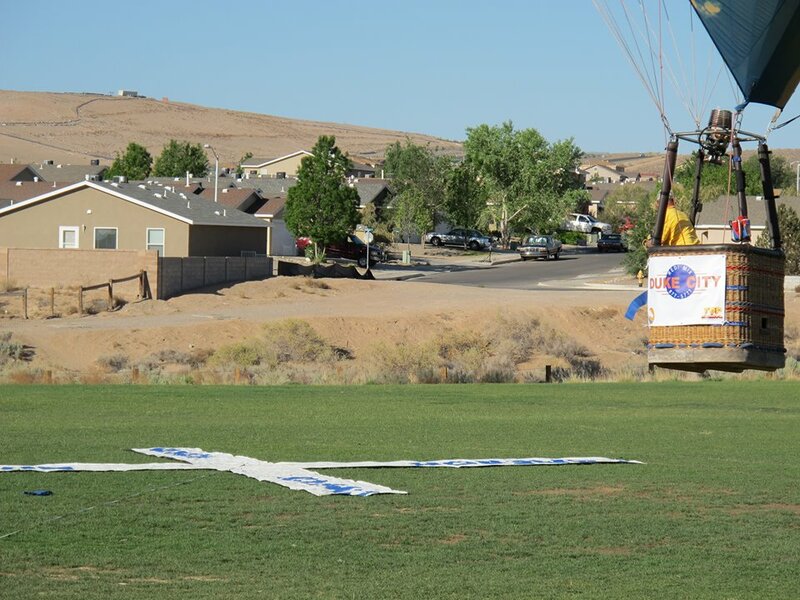 The event was put on by the Top Gun Balloon Competition group. Only morning competition flights were scheduled and the event got all three of the flights off. The pilots were all housed at the same hotel on the West side of town that had a courtyard with a pool and the event tent for socials was also collocated. With no common launch site, Jim Birk as Director and the use of GPS loggers it was full on competition. In fact, nothing but competition is the best description for all of the flights. The challenges the pilots faced each morning was nothing short of World Class task calling. If you like competing, this was nothing short of a championship event. Jim Birk called a three part task. A fly in to a school grass field, followed by a Hesitation Walz with two possible goals, and finally a Fly On task using only logger tracking. For all task, the loggers were in play with one minor adjustment, no 3D scoring or results were allowed above 7400 feet msl (approximately 2000 agl). At briefing and for a period of about one hour following the conclusion of briefing, surface winds were light from the North with a turn to the right or Southwest. The forecast winds for later in the morning and afternoon were to turn and come from the South. Task 1 and the FIN saw the earliest balloons aloft picked a line from the Northwest. A middle group chose a little more of a West line and a couple of balloons chose to come in from the Southeast and high. Eleven pilots made it into the MMA area of 100 meters with the top five in order being Erick Greenwood, Will Lapointe Michael Glenn, Bubba Cliver and Jason Buckner. Task 2 and the HWZ proved unreachable as the wind shift once started simply continued to swing more and from the East/Southeast to settle aloft out of the south. The early balloons to Task 1 had to hug the ground trying to get the left to either of the goals. One goal was 242 degrees, 3,575 meters from the FIT. The other was 221 degrees at 2,428meters. Ultimately, Kirk Hooper who finished 14th in task 1 got the closest at 745 meters. The rest of the top five for task 2 included Jason Buckner, Michael Glen, Neil Jackson and Steve Adams. Task 3 and the FON task quickly became a challenge in the slowly shifting winds. To increase the challenge based on developing wind direction, there became only two possible goals to attain in the flying area. Take the choice to get as close as possible in Task 2 and making one of these two goals would be impossible. The best results would ultimately show that pilots who could make it to a point approximately 1,500 meters riding the surface winds could still achieve a good result on the Pilot Declared Goal (FON). Of the top ten finishers in task 2, seven of those finished in the bottom third in task 3. Robert Gonzales won task 3 being recorded at 4 meters from goal. The rest of the top five included Ron Sanchez, Dale Wong, Brooke Owen and Kinnie Gibson. There were a few 25 point penalties given for making the declaration at the wrong place. Options included to a judge at the HWZ goal or on the tail of the marker. With the goals south and flying space at a premium, some pilots gave the declaration to officials at the FIN task site. At the conclusion of flight the results had Neil Jackson in 1st place, Michael Glen 2nd, Bubba Cliver 3rd, followed by Kinnie Gibson and Brooke Owen. Jim Birk called a three part task for the day’s flight. Once again, pilots would be faced with making decisions in the air. Task number 4 was a FIT, followed by a Hesitation Waltz with two possible goals and finishing with a land run task. As with a lot of competition mornings, the day began with good steering which softened as the morning went on. Winds were from the Northwest low and turning out of the North with altitude at approximately 600 feet above ground level. Winds turned back out of the Northwest above the middle layer. Wind speed was also faster than the day before being 6 to 8 knots on the surface. The challenge in the day’s flight would be the decisions made in the land run task which was task 6 for the event. The direction required from the FIN task to the two judge declared goals for the HWZ were Bearing 156 degrees / 1555 meters to the Western HWZ goal and 138 degrees / 2130 meters to the Eastern goal. The area described for the Land run task was a 3000 meter circle around a point. That point turned out to be located between the two HWZ goals, but closest to the eastern HWZ goal. Based on the wind direction, in was only 200 meters from the eastern HWZ goal and directly on the required bearing from the FIT to that Goal. To add to the challenge, the FIT was inside the Land Run Task radius by 1000 meters. The Land run task required 3 points. The first point would be where a pilot entered the 3000 meter radius, the last point would be the exit of the 3000 meter circle. The middle point which would define the triangle area being scored would be the best 2nd point. Call it the turn point if you will. In effect, the balloons would enter the circle at the same point, and the point they make the turn would have to come after clearing the HWZ goal. Eric Greenwood who won the first task on day one, again won the first task on day two. As an interesting side note, the event officials had a raffle for anyone who wanted to participate. Call it a duck raffle. For ten bucks, you could pick a duck which represented one of the pilots in the field. If that pilot won the first task of the morning, you won half the money in the pot. The other half remained with the event to cover expenses. Here was the trick, when you picked your duck you didn’t have any idea which pilot that duck went to. You only found out after picking the duck. The remaining top five scores for task 4, FIN task where Kinnie Gibson, Bubba Cliver, Dale Wong and Michael Glen. Results for the HWZ all occurred on the most eastern goal. Wind speed made it virtually impossible to get to one of the goals. Results for the HWZ had Earl Buzzard in the top spot for the task followed by Eric Greenwood, Jeff Giles, Dale Wong and Will Lapointe. The best result for the land run task was Kinnie Gibson who went high to get a turn to the Northeast following clearing the HWZ goal. He result was so much higher than the rest of the field, it caused virtually every pilot to receive low scores as the turn off the HWZ task was not very big by either flying middle winds or hugging low for the best left. However, Kinnie was given a penalty of 966 points for a distance infringement under rule 13.3.5. which turns out to be the same score as a no result. The task sheet had a note at the bottom which stated Tracker scoring – 2D scoring less than 7,400 feet msl, no scoring at or above 7,400 feet msl. 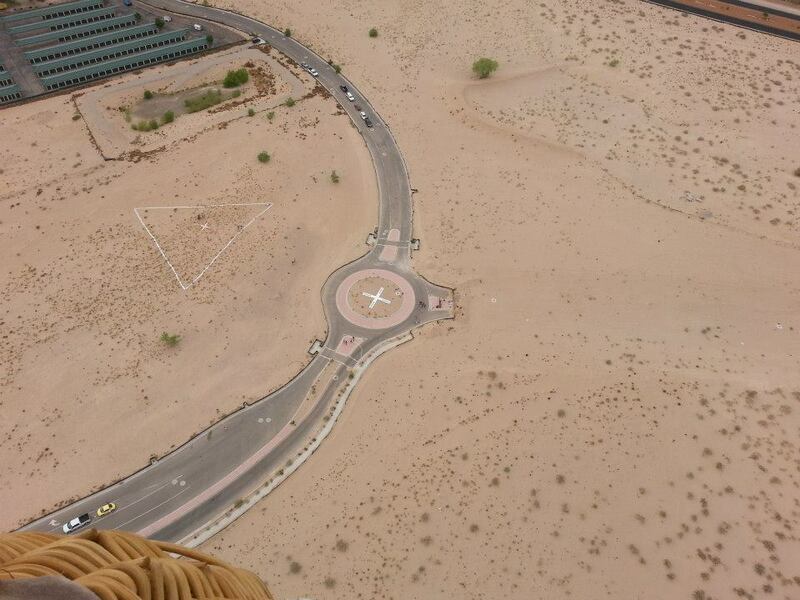 The penalty assessed was based on the altitude at which he crossed the 3000 meter radius on the exit to the Land Run area. Therefore, the top five scores on the task were taken by Steve Adams, Jeff Ashworth, Mike Johnson, Eric Greenwood and Jason Buckner. The highest score on the task was 631 points based on the scoring formula following penalties. The top five pilots for the day’s flight were Eric Greenwood, Jeff Gilles, Will Lapointe, Craig Pendleton and Dale Wong. The top five in the overall standings saw Eric Greenwood in 1st followed by Bubba Cliver, Jeff Gilles, Michael Glen and Dale Wong. The final day of the competition proved to again be a challenging day based on changing winds. Yet some pilots demonstrated some outstanding decisions in reaching the goals for the two tasks. Jim Birk called for two Gordon Bennett Memorial task (GBM). The two tasks would end up being very close to each other. On the first GBM, a target was placed inside of a roundabout with a road leading in from the north and the south. A stub of a street to be cut also extended slightly from the roundabout to the west. The scoring area was the pavement between curbs on the roundabout or street within 100 meters of the target. The second GBM was outside a triangle located around a target inside the triangle but within 100 meters of the goal. Birk planned on surface drainage to carry the balloons to the second scoring area. The winds were very gentle but Albuquerque turned out to be challenging in the wind department. Task wind information and readings taken just prior to the majority of launches showed a standard steering day. However, this did not remain constant and many pilots found themselves trying to get to the scoring area by remaining low and using topographical winds in a fairly deep arroyo. 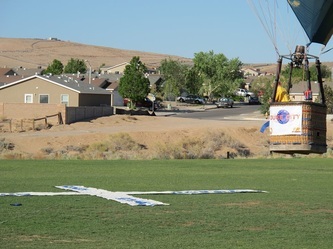 Upon gaining enough easterly track, winds above the surface were taking balloons well right (west) of the scoring area but slow at 3-5 knots, within 400 feet, winds were taking balloons well left (east) of the scoring area but at a 10-12 knot clip. For pilots that could get over the scoring area, the surface was almost west to east but very slow. Less than 200 feet off the deck, direction was almost east to west. However, this only remained in the scoring area for about a half an hour before the final wind shift turned balloons to the North Northeast. It was on the final morning that superb decision making by Dale Wong won him the event. 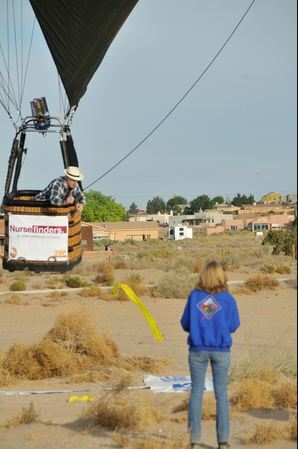 Dale was in a group of balloons that appeared to be in a position to miss the scoring area to the right. As stated, he was also in a group that ducked into the combination narrow valley and arroyo that tracked them slowly to the East. 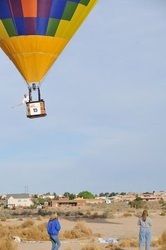 The group of balloons exited the valley to begin tacking hard right slow and hard left fast towards the scoring area. Dale made a choice to use faster winds but to get well East and Northeast of the scoring area and then very slowly track back to the scoring area making his approach from the opposite side of the field. It paid off for him just in time as he won the day with a 1st and a 3rd scoring just 4 points short of a perfect 2000. Joining Dale Wong as the RGC champion was Brooke Owen in 2nd, Steve Adams 3rd, Michael Glen 4th and Erick Greenwood 5th. Based on the different categories which removed results from the overall field, the Southwest Regional top five spots were Eric Greenwood champion, followed by Adams, Owen, Jackson and Cliver. The subcategory for the New Mexico Champion shifted the field results slightly and the State winner was Steve Adams followed by Greenwood, Adam, Owen and Jackson in that order. Kudos to the Top Gun Competition club and Jim Birk for hosting and making the 2013 Rio Grande Classic exactly that. A classic competition.